The 23rd April 2016 is the 400th anniversary of William Shakespeare's death. If he'd been around today and was creating interactive stories or interactive plays what would he have written? 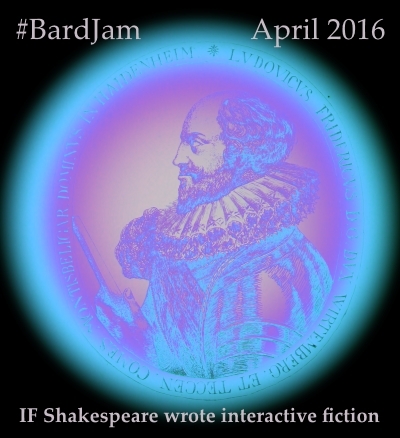 Now's the chance to show us by joining in this text based game jam and create your own Shakespeare tale based on his writing. Submissions to this game jam could include interactive fiction, text adventures or any other game where text is a key part of the entry. Even though the focus of this game jam is text, feel free to include images, sounds, etc as long as the main element is the text. This game jam is open to everyone and runs for all of April 2016. An additional theme will be announced on 31st March. Update: Even if you're working on a game and won't have it finished by the deadline I'd still be interested in seeing what you're working on, so please feel free to upload it even if it's incomplete. "Knock, knock, knock! Who's there?" In works of interactive fiction (IF) the writer presents a text story, but gives the reader the option to deviate from the thread of the narrative, or direct it along a particular path at various points along the way. Choose Your Own Adventure (CYOA) books and text based computer adventure games that were particularly popular in the late 1970s and early 1980s are both examples of interactive fiction. and the regular IFComp brings interactive fiction bang up to date with new games. A short game based on Shakespeare's The Tempest.